Myspace, Facebook, Twitter–the huge community these social media sites offer make it evident that we are in embracing social media. According to Microsoft we have passed a significant watershed: now for the first time people are spending more time online than they spend watching television. Now, there is a new social media site to watch out for–Sitetalk. The creator of this site is Unaico (United Nordic Alliance Investment Company), who falls under a larger corporation The Enigro Group. 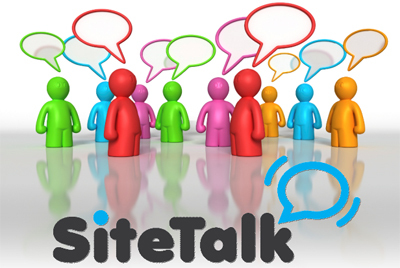 They claim that Sitetalk will not only will connect you to other individuals so you can enjoy the networking, communication and sharing opportunities, but that you can also make money by investing in the company. All you need is desire–the rest is up to their “state-of-the-art site platform”. Sounds great, but the problem is–they are still very unclear as to how. They compare the money-making capabilities of the site to that of the microwave, the cellphone, and the internet. But there is no real business model available on the site that actually explain just how a social media site can accomplish this. On top of that–I recently signed up to see what the site was all about. From my research, the site was originally launched in February, but the first message I got when I logged in was that the site is not finished yet. How can a social media site that claims to be as successful at Facebook, with huge money-making possibilities launch the site before it was complete? And then, still be “working” on the foundations six months later. On June 12th, front-page headlines of Norwegian financial newspaper “Dagens Næringsliv” wrote a revealing story about Unaico/Enigro titled The Norwegian Man behind Giant Pyramid Scheme. The Gaming Board of Norway has made a preliminary assessment of the networking company and released a statement on their website saying that “Enigro has clear similarities to illegal pyramid schemes”–where the main form of return of investment (ROI) comes from recruiting more investors. They are requesting anyone with more information about the originators to contact authorities. Despite these claims, if you look around the internet, you will indeed find supporters and people who claim to be making a profit already from Sitetalk. They have given many meetings and presentations to thousands, and no doubt have a steady growing number of investors already. But if you are seriously considering becoming a part of Sitetalks stockholders–then I would recommend doing some serious research.